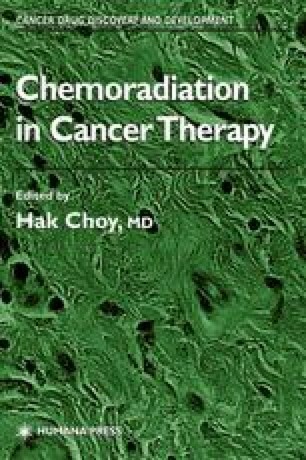 Despite recent advances in the technology and techniques for delivering radiotherapy to patients with malignancies, the inability of maximally tolerated doses of radiation to locally eradicate all of the malignant cells remains a major clinical problem leading to failure of the overall treatment plan. As described by Rosen et al., there are a variety of reasons why tumors recur locally after radiotherapy (1–3). A “geographic miss” occurs when a portion of the observable tumor volume is excluded from the radiotherapy port and those tumor cells receive a nominal dose of radiation. Frequently, the distribution of radiotherapy dose to the gross tumor is uneven, with the central portion of the targeted volume receiving a higher quantity of radiation than the cells at the peripheral tumor/normal tissue interface. These tumor cells at the edge of the radiation port therefore can receive a subtherapeutic or sublethal dose of radiation and retain the ability to regrow and repopulate. This is referred to as a “marginal miss.” Irradiated tissues can also potentially be recolonized with tumor cells from regional anatomic sites or from hematogenous dissemination. This is referred to as “repopulation.” However, the major cause of local recurrence is the inability of maximally tolerable dosages of radiation to completely eliminate the malignant cells within the tumor mass. Radioresistance in this sense is relative, since presumably there is a dose of radiation that would kill all of the malignant cells if toxicity factors inherent to the host did not preclude its delivery.